We’re all getting ready for Valentine’s Day here! At Arcady Vineyard Bed and Breakfast, we always try to find something different to offer our guests. We always have the wine tours available, they have been a “hit” now for going on five years. We’ve even been written up by Frommer. So here at the B&B we have been working with tempering fine Belgian chocolate and are offering not just chocolate dipped strawberries, oh no! Our new offering which we are introducing on Valentine’s Day to be available on a regular basis to our guests is a hand dipped and drizzled Cabernet Sauvignon or Merlot bottle of wine! We’ve always loved the combination of chocolate and red wine, and know our guests will too judging by how they like our Gerhardt chocolates with the turn down port. 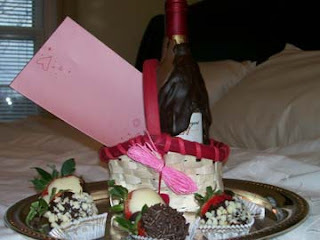 The wineries have some lovely Valentine offerings as well. Keswick Vineyards has a wonderul specialty dipped strawberry and wine pairing that goes far beyond your regular old chcolate dipped berries and wine on the 16th of February! Kluge had a beautiful heart shaped topiary packaged with their sparkling rosé in a basket. First Colony will have their yearly Wine and Chocolate pairing on February 9, Whitehall has a Custom Blendin Event on February 8, and King Family Vineyard and Veritas both have Valentine Dinners planned for the 14th! **whew** Lots to see and do. I hope I didn’t miss anybody! Seems like there is something for everyone.